Every animal on this earth protects itself from other animals and gets the food. 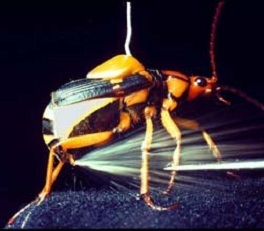 Few of them contain self weapons which help them in protecting themselves and bombardier beetles are one of them. They release the liquid which is of 100 degrees centigrade and this liquid contains the combination of hydrogen peroxide and hydroquinone. It is 2 centimeters in length and it contains two different portions in the stomach which contain these liquids. They will tighten the muscles and release this liquid. They are in America, Europe, Africa and Australia. « How does the hollow form on the moon surface? | What are the consequences of formation of hollow layer? » How was Homeopathy discovered? | Who has discovered the principle of homeopathy and how?